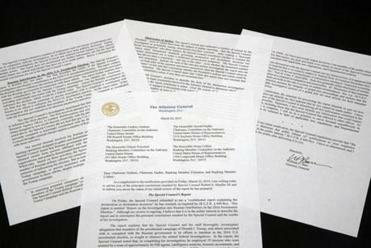 The letter from Attorney General William Barr to congressional leaders regarding the Mueller report related three important conclusions. The first is that the president is completely off the hook with respect to any illegal conspiracy with Russian influence in the 2016 election. The special counsel found no evidence and has concluded that no crimes were committed by the President. That is total exoneration. Second, as to obstruction of justice, the issue is a bit more nuanced, but the conclusion is essentially the same. The special counsel concluded that he would not recommend charging the president with obstruction of justice. His report will lay out the arguments for and against the president having obstructed justice. But that will be largely a hypothetical exercise, since both the attorney general and the deputy attorney general have concluded that they would not charge the president with obstruction based on the evidence, even if a sitting president could be prosecuted. The bottom line, therefore, is that the president has been legally exonerated from both Russian conspiracy and obstruction of justice. But the report itself, which will probably not be released for several weeks based on tasks the attorney general has indicated must be completed, will paint a negative picture of the president’s actions, particularly with regard to obstruction of justice. This raises fundamental questions about the propriety of a special counsel report stating a conclusion that the president has not been exonerated and that there are arguments on both sides as to whether he committed a crime. How is this different from what former FBI director James Comey did when he announced that Hillary Clinton would not be charged with a crime, but her conduct was extremely careless? Many experts, as well as lay people, were critical of Comey’s public statement that went beyond simply announcing that Clinton was not going to be indicted. Many Democrats believed Comey’s criticism of Clinton may have had political implications and damaged her campaign. Many Republicans applauded Comey’s criticism, hoping it would influence the campaign, which it may well have. The same is true of Mueller’s statement that Trump has not been exonerated. It, too, may have political implications and may influence the 2020 campaign. Democrats will seize on that statement as an invitation to subpoena Mueller himself and the evidence on which he based his equivocal conclusion. The attorney general released his findings Sunday afternoon. To be sure, there are some differences between a special counsel and an ordinary prosecutor. Special counsels are required to produce a report of their work to the attorney general, but there is no requirement that they disclose to the public arguments that were made in favor of an indictment that was never issued. Recall that as fair as the Mueller investigation may have been, it was still a one-sided affair conducted only by prosecutors based on testimony that was not cross-examined and evidence that was not subject to adversarial testing. Is it fair therefore, for the special counsel to disclose his one-sided conclusions that are critical of the subject of his investigation? After all, when the decision is made to indict, the defendant has the opportunity to contest that indictment at an adversarial trial in which he can have his defense attorney challenge the prosecutor’s evidence and present their own defense. None of that is available to a person who has not been indicted but who is condemned in a prosecutorial report. That’s why many civil libertarians have long opposed prosecutorial statements that go beyond thumbs up or thumbs down on an indictment. But most civil libertarians will remain silent in this case because the person being criticized by prosecutors is Trump. As a neutral civil libertarian who voted against Trump, I have concerns about the precedential effect of prosecutorial statements that go beyond the traditional role of prosecutors. I expressed those same concerns over the Ken Starr report about Bill Clinton as well as over other reports issued by special prosecutors in the past. The attorney general and his staff will now be vetting the report for classified and privileged material. They might also consider vetting the report for statements critical of non-indicted persons. I doubt they will do that, since that would gut much of what we can expect in the report. So stay tuned for the final Mueller report and for the response that the Trump team may well seek to publish.